February 03, 2019, 6:43 p.m.
YouGov was recently commissioned by the Muslim Council of Elders to conduct a multi-country study on attitudes to religion in the West and Middle East/North Africa region, in support of an interfaith meeting between His Holiness Pope Francis and the Grand Imam of Al Azhar, Shaikh Ahmed Mohammad al-Tayeb, in Abu Dhabi on 5th February. As findings show, substantial portions of Western respondents in the survey perceived a clash between Islam and the values of society in their country. This included nearly half of respondents in France (46%) and Germany (47%), and a plurality in the United States (36%) and Britain (38%) who chose this statement. 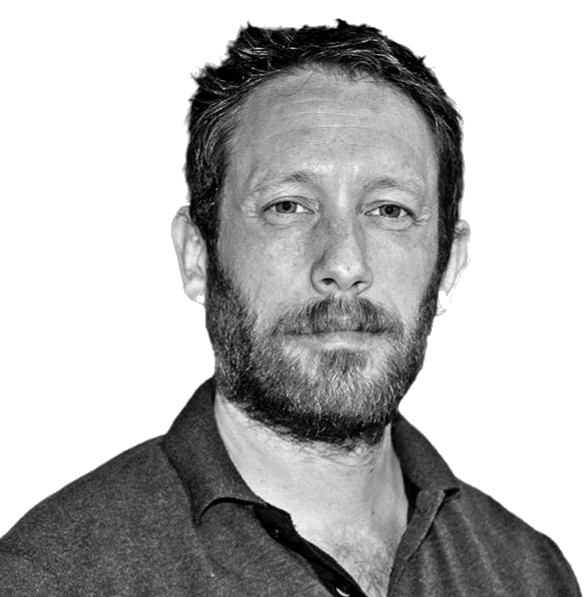 Notably smaller portions chose the alternative statement – that Islam is generally compatible with the values of society in their country – including 22% in France, 20% in Germany, 17% in the United States and 24% in Britain. In other results, general impressions of Islam were comparatively less favourable than that of other world religions among significant numbers of Western respondents. For instance, all four Western samples had a discernibly higher number of respondents who felt unfavourable to Islam, compared with other religions. The United States and Britain showed a similar trend but with smaller portions overall who felt unfavourable towards Islam (37% and 32% respectively). In a question about marriage, a majority of respondents in each Western sample thought that most people in their country would mind to some extent – either a lot or a little – if one of their close relatives were to marry a Muslim. This included: 68% in France (30% “mind a lot”/ 38% “mind a little); 66% in Germany (34% “mind a lot”/ 32% “mind a little); 50% in Britain (14% “mind a lot”/ 36% “mind a little); and 51% in the United States (22% “mind a lot”/ 29% “mind a little). Smaller numbers thought most people “would not mind at all”, including 11% in France, 15% in Germany, 21% in Britain, and 17% in the United States. Again, looking at results from the comparative surveys, only 21% of British respondents overall thought most people would mind a lot/little about a close relative marrying a Buddhist, compared with 52% thinking most would not mind at all. The figures for Sikhism and Hinduism were both 34% overall thinking most would mind a lot/little versus 36% saying most would not mind at all. In the United States, the respective balance was 35% versus 28% for Buddhism, 40% versus 16% for Sikhism and 39% versus 22% for Hinduism. Results were more mixed in the main study regarding a variant of the question asking if respondents would personally mind if one of their close relatives were to marry a Muslim. This time, just under half of respondents overall in both France (47%) and Germany (48%) said that personally speaking, they would mind – either a lot or little – if one of their close relatives were to marry a Muslim. This included 27% choosing “would mind a lot” in both countries and near identical portions of 20% in France and 21% in Germany choosing “would mind a little”. Nearer to a third in both Britain (27%) and the United States (33%) suggested they would personally mind. In Britain, this included 12% choosing “would mind a lot” and 15% choosing “would mind a little”. In the United States, the figures were 20% for “would mind a lot” and 13% for “would mind a little”. In contrast to Western responses about Islam, respondents in the MENA were less likely to say there is a fundamental clash between Christianity and the values of society in their country. This included 25% in Saudi Arabia, 22% in Algeria, 7% in Egypt and 13% in the UAE. 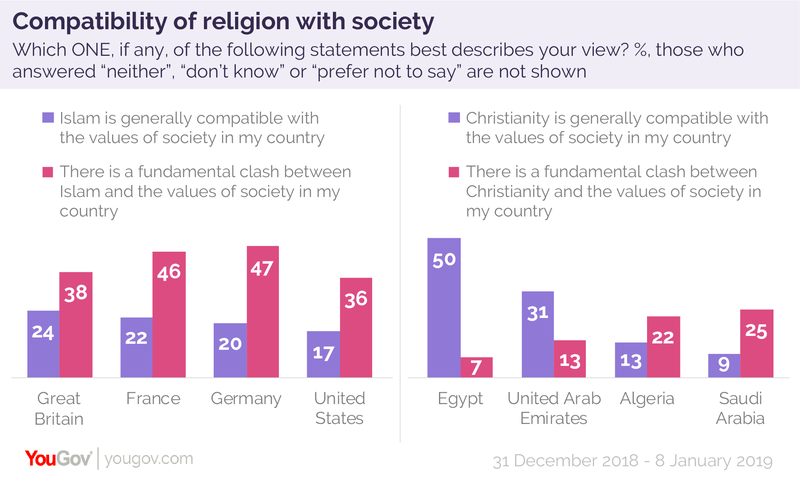 Also notably, half of respondents in Egypt (50%) and a third in the UAE (31%) backed the alternative view that Christianity is generally compatible with the values of society. In Saudi Arabia and Algeria, however, respondents were much less likely to say the same, with just 9% and 13% backing this view respectively. In the wider outlook, large portions of respondents in Saudi Arabia, Algeria and Egypt tended to describe themselves as unfavourable to religions other than Islam. This included majorities in all three countries who felt either fairly or very unfavourable towards Hinduism (Saudi Arabia 64%/ Algeria 64%/ Egypt 72%), Sikhism (Saudi Arabia 62%/ Algeria 62%/ Egypt 72%) and Buddhism (Saudi Arabia 66%/ Algeria 67%/ Egypt 76%). Majorities in Saudi Arabia and Algeria said the same for Judaism (54% and 55% respectively) while a smaller plurality in Egypt (40%) shared that view. Perhaps on a positive note for the interfaith meeting in Abu Dhabi, results were to some extent warmer towards Christianity, with a comparatively smaller 42% in Saudi Arabia and 43% Algeria who felt unfavourable towards the religion, alongside 31% in Egypt and 13% in the UAE saying the same. Respondents in all MENA countries also claimed to know more about Christianity than other religions. For example, 41% of respondents in Saudi Arabia described themselves as either very or fairly familiar with the basic teachings of Christianity, compared with 17% for Hinduism, 9% for Sikhism, 28% for Judaism, and 13% for Buddhism. Results in Algeria, Egypt and the UAE followed a similar trend. Similar to the equivalent question in Western surveys about marrying a Muslim, a majority in each MENA sample considered that most people in their country would mind – either a lot or a little – if one of their close relatives were to marry a Christian, including 68% in Saudi Arabia, 71% in Algeria, 73% in Egypt and 55% in the UAE. Results were again more mixed in a variant of the question asking if MENA respondents would personally mind if one of their close relatives were to marry a Christian. Majorities in Saudi Arabia (57%) and Egypt (55%) said they would personally mind either a lot or a little, compared with 20% and 27% in these countries respectively saying they would not mind at all. In the other two MENA samples, the balance was closer, with 46% in Algeria saying they would mind either a lot or a little, next to 33% saying they would not mind at all, and 41% in the UAE saying they would mind either a lot or a little, compared with a near identical 40% saying they would not mind at all. In contrast to Western respondents, however, people in Saudi Arabia, Algeria and Egypt expressed markedly lower levels of concern about extremism in Islam, which often tended to be more in line with levels of concern about the same problem in other religions. For instance, 39% in Algeria described themselves as either very or fairly concerned about the possible rise of extremism in Islam, compared with 36% for Christianity, 32% for Hinduism, 26% for Sikhism, 32% for Buddhism, and 50% for Judaism. 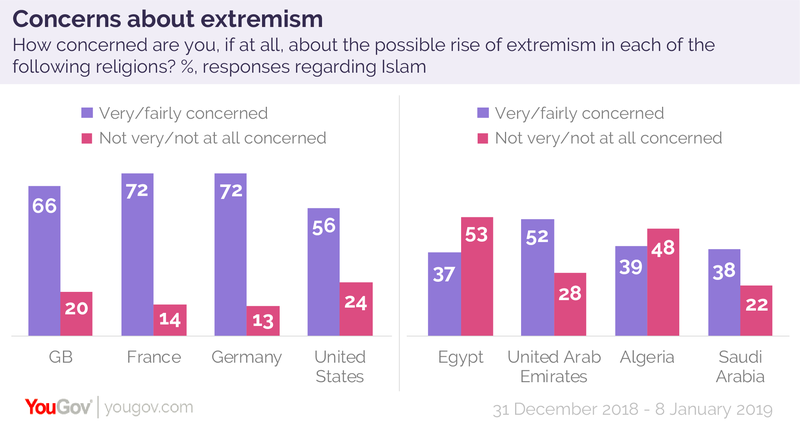 Results from the UAE showed a comparatively higher level of concern on this issue, with 52% describing themselves as either very or fairly concerned about the possible rise of extremism in Islam. This figure also points to another trend in the study, namely that UAE results overall are often nearer to that of Western samples than to fellow MENA samples when it comes to general attitudes to world religions. For example, while substantial majorities in the other MENA samples had unfavourable views towards Hinduism, Sikhism and Buddhism, barely a third said the same in the UAE overall. The larger portion of Christians in the UAE sample is naturally a key factor here. But there are also various differences between Muslims in the UAE and that of other MENA samples. Hence among Muslims, only 41% in the UAE felt unfavourable to Sikhism, compared with 63% in Saudi Arabia, 62% in Algeria and 73% in Egypt. Views towards Hinduism and Buddhism portray similar numbers. As findings further show, there is some effect on results but arguably not a major one when respondents say they personally know someone from the religion in question. For instance, 12% of respondents in Saudi Arabia overall were favourable towards Christianity, compared with 18% among those who said they personally know a Christian. Similarly, 12% in Algeria and 44% in the UAE were favourable towards Christianity overall, compared with 22% and 50% respectively among respondents who personally know a Christian. Likewise in the West, 13% of British and 15% of US respondents overall described themselves as favourable to Islam, while among those who said they personally know a Muslim, the figures were 17% and 21% respectively. Methodology main study: All figures, unless otherwise stated, are from YouGov Plc. Total sample sizes were: Algeria = 1017; Egypt = 1009; UAE = 1007; Saudi Arabia= 1015; France= 1010; Germany= 2054; USA= 1295; GB= 1754. Fieldwork was undertaken between 31st December 2018 and 8th January 2019. The surveys were carried out online. For Western markets, figures have been weighted and are representative of the adult population aged 18+. For MENA markets, the figures have been weighted and are representation of the online adult population aged 18+. Methodology comparative surveys: All figures, unless otherwise stated, are from YouGov Plc. Total sample sizes were: USA= 1241; GB= 1650. Fieldwork was undertaken between 28th and 31st January 2019. The surveys were carried out online. For both markets, figures have been weighted and are representative of the adult population aged 18+.